I’m a sucker for posters. I ran across these at a local shop today on a random visit. All four of these guys were bundled together and obviously have some age to them. I immediately recognized the three Missouri scenes as Hannibal, Old Town St. Charles and St. Louis. 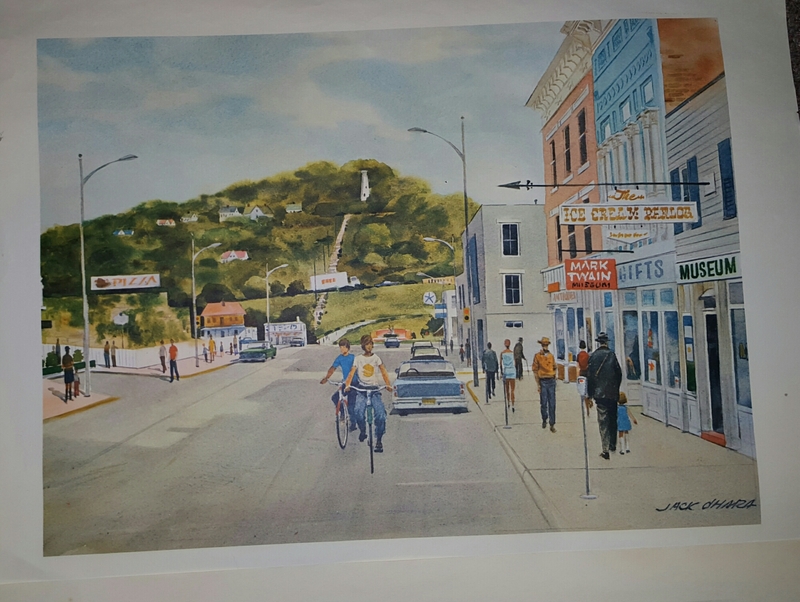 The Hannibal street scene shows a large mound, which is an immediately recognizable feature of the town, and it also shows storefronts like “Ice Cream Parlor”, “Mark Twain Museum”, “Gifts”, “Pizza”, “Antiques” and “Museum”. Judging from the t-shirt on the bike-riding kid in the foreground, this was completed in the 1970s. 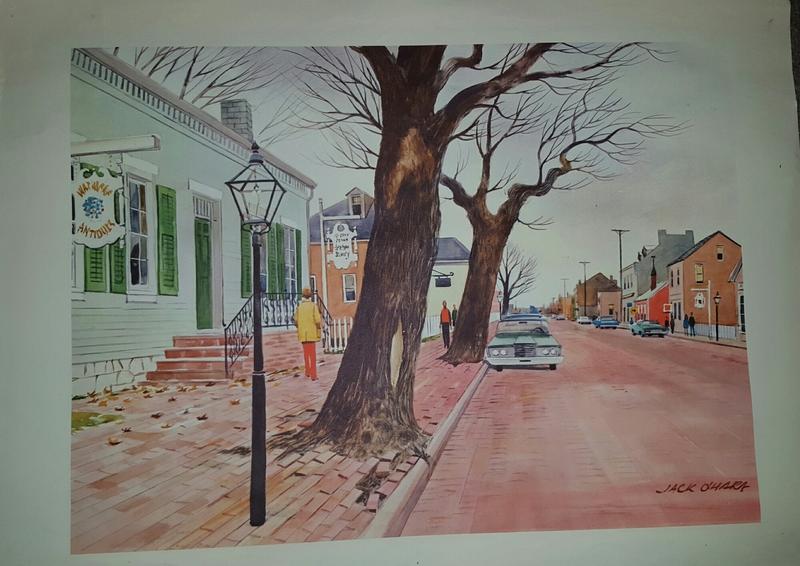 The second poster, clearly Old Town St. Charles, shows Main Street’s cobblestone streets that still remain today. Also shown are the quaint old-time storefronts and one legible hanging sign for “Antiques”. The cars also suggest that the image was representing the late 1960s or early 1970s. 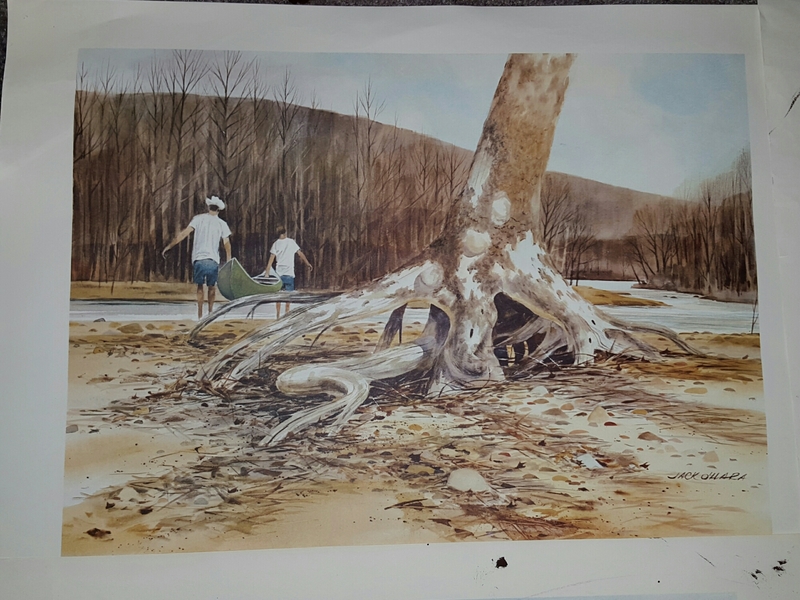 The third is a riverbed scene that shows an uprooted tree in the foreground and two (perhaps young) people with their backs to the artist, carrying away a canoe towards the water’s edge. Not all that dynamic, but definitely could have been inspired by Missouri streams. 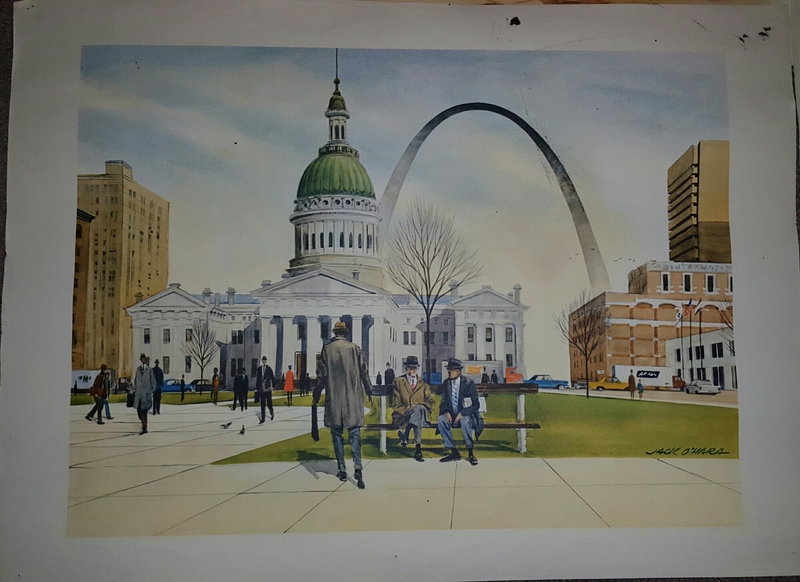 The final one is perhaps the most recognizable of all: St. Louis’s Gateway Arch and the old County Courthouse. Men in suits and hats walk the streets as if the artist is catching “lunchtime”. Cars and clothing suggest the image was also created in the late 1960s or early 1970s. 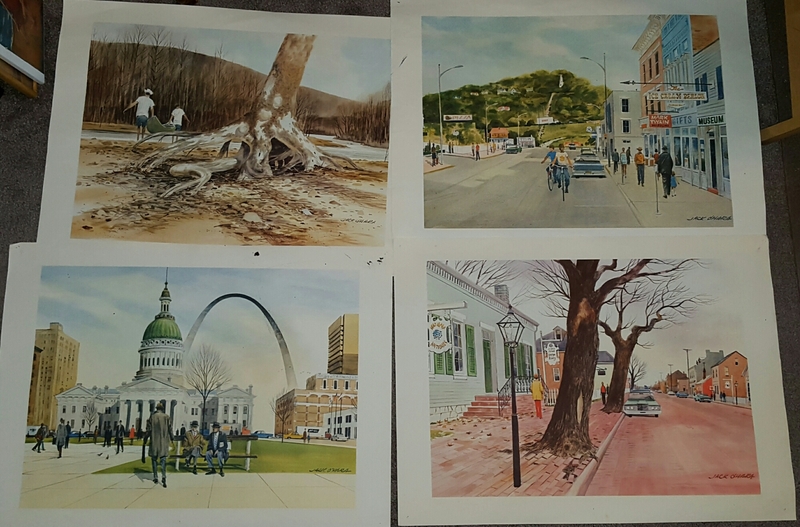 Perhaps the artist did a series of Missouri towns? I hope you get a kick out of them like I do. And you wouldn’t believe what I paid for them if I told you. Jack Butler O’Hara, 91, passed away peacefully on April 6th. After a lengthy battle with Alzheimer’s disease, his last days were spent remaining cheerful and loving. His sense of humor endured and he made the most of the life he had left. Born January 27, 1921 to Ben and Dorothy O’Hara. He attended Southwest High School graduating in 1938 as Class President. He attended the University of Kansas where he was a member of Phi Delta Theta and lettered in track. He also attended the Kansas City Art Institute and the American Academy of Art in Chicago. He was an Eagle Scout and a member of the Tribe of Mic-O-Say. During World War II, he was a 1st Lt. in the Medical Administrative Corp and spent a year in the Philippines. Following his release from the army, he worked in the editorial department at Hallmark Cards. Three years later, he joined Valentine-Radford Advertising Agency and eventually became a partner. After 21 years with the agency, he retired to paint full time. His principle medium was watercolor and, after being accepted five times in the annual show in New York City, he was accepted as a member of the American Watercolor Society. His work is in private and corporate collections both here and abroad, including Senator Nancy Kassebaum and Senator Thomas Eagleton. He is also represented in the permanent collection of the Spencer Museum, Lawrence, KS, the Kemper-Albrecht Gallery in St. Joseph, MO, the Farnsworth Museum in Rockland, Maine, the Muchnic Museum, Atchison, KS, the Kansas City Art Institute, the Nelson- Atkins Museum, and the Nevada Museum of Art, Reno, Nevada. He exhibited numerous one-man shows including a show of Irish landscapes at the Nelson- Atkins Museum of Art. In addition to his landscapes, he became well known for his portraits. He was on the board of the Kansas City Museum, the Nelson- Atkins Council of Fellows and Pets for Life. He was a member of the Kansas City Country Club, the Moorings Club, Vero Beach, FL, the Garden of the Gods Club, Colorado Springs, CO and a former member of the University Club and the Vanguard Club. He leaves his wife of 58 years, Marie Bell Watson O’Hara, son Thomas Watson O’Hara and wife Laura and twin children Callae and Jack, son David Benjamin O’Hara and son John Burns and wife Catie and their sons Luke and Dan. Jack also leaves his twin sister JeanO’Hara. He was fortunate to enjoy his life surrounded a wide circle of friends.